If there's one thing that makes me think "I really need to finish the storm windows," it's the bone chilling 4 degree cold we had a week ago (that was the lowest in 20 years) combined with the associated high winds and billowing drapes that accompany it. Did I just say "billowing drapes?" Well, that doesn't make much sense if the windows are closed. Exactly! You see, our windows are what you call "leaky." No, I'm not talking about little air leaks you find in almost any window, I'm talking about giant gaps large enough for you to stick your fingers through. When the wind really picks up, it actually whistles through our windows and you can see our heavy window treatments move. But these gaps can't be blamed on an "old window thing." Nope, the age of the window has little to do with it, they're really a "caused by me" thing. Our crazy leaky windows are largely due to the fact I can't seem to finish a project before starting a new one, and I'm midway through the restoration of our windows and haven't yet added back our parting beads, sash stops, weather stripping, or (long overdue) storm windows. I've caused this, I'm at fault, and I accept that. Now it's time to start doing something about it. To begin remedying our situation I'm going to focus on the next phase of our window restoration process, the installation of spring bronze weather stripping around the window frame's jambs. 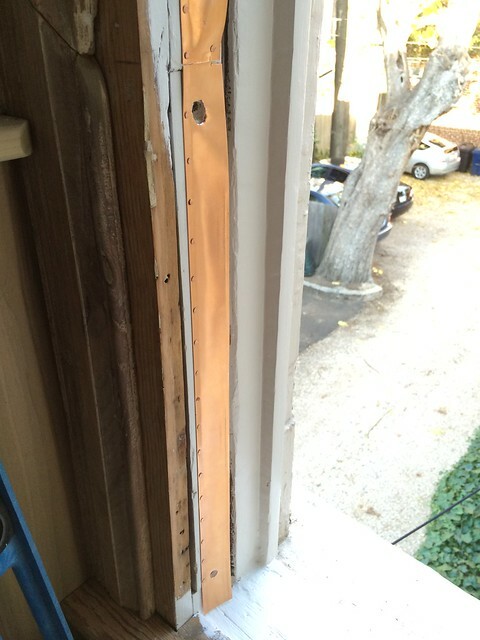 Ultimately, this is only one aspect of weather stripping our windows, but it's one of the most critical. At this point in our project, we've removed the sash stops, parting beads, and sash from the windows, stripped the paint from the frames, and made any necessary repairs to the frames. 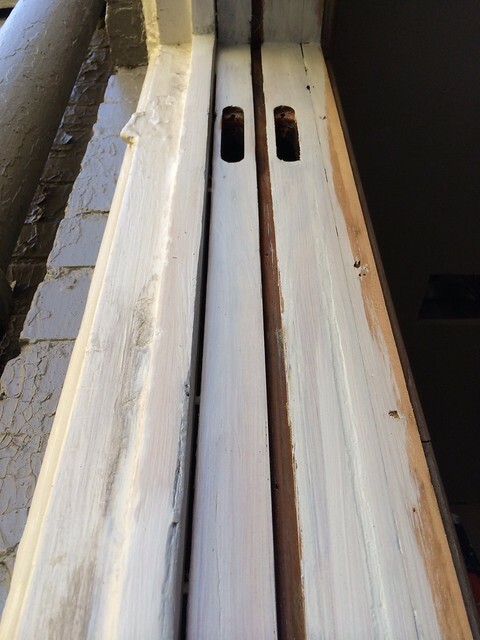 Before applying the weather stripping, we needed to sand and apply a few coats of paint to the frames. I'm not going to cover the painting process too thoroughly, as it's very straight forward. I like to use a coat of oil/alkyd based primer and follow that up with two coats of our desired trim color. The only caveat, the exterior trim color goes on the upper sash channel, while the interior trim color goes on the lower sash channel. If that sounds confusing, just think of the colors and locations, and when you're likely to see each color (either from inside or outside) when the windows are closed. Okay, on with the weather stripping! In order for windows to open and close properly, the window sash has to be slightly smaller than the window frame. If it were too large, it would just get stuck and never move. But this size difference means that older windows, by design, have gaps around the sash that also allow a significant amount of weather infiltration (hot, cold, wind, rain, snow, bugs, ghosts, woodland creatures, you name it). 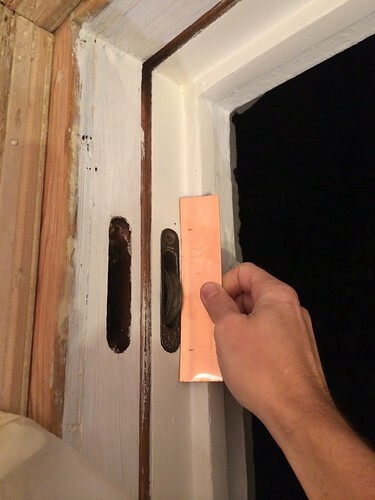 I've seen lots of crazy ideas that attempt to address this issue of cold getting in around the window sash's sides, from the extreme of caulking or painting a window completely shut, to the impractical idea of shoving fiberglass insulation into the gaps so the window begins to look like it's growing pink fur. While these are ideas...they aren't ones that work or meet our needs. 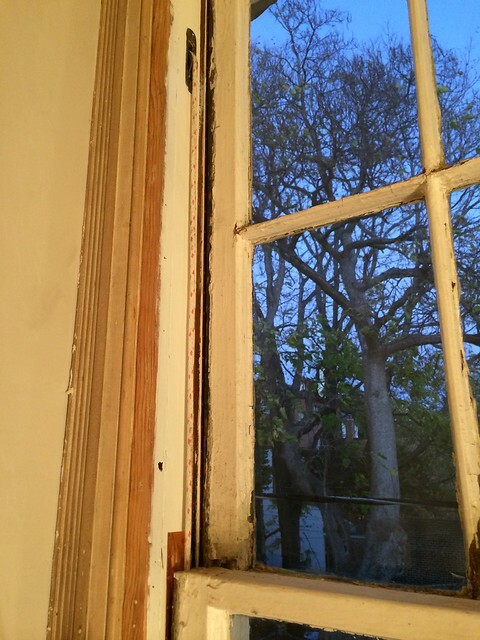 Rather than trying to come up with a crazy scheme to beat the cold, why not use an idea that's been around for as long as these old windows have sat in our home's walls? 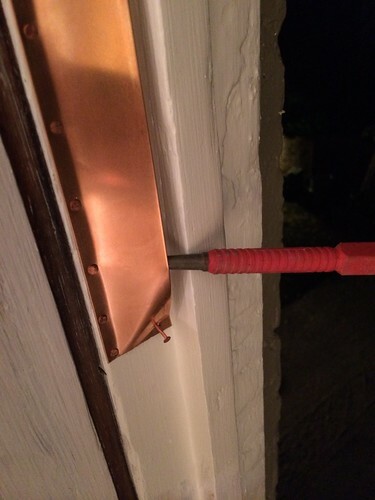 Why not use some spring bronze weather stripping to do the trick? 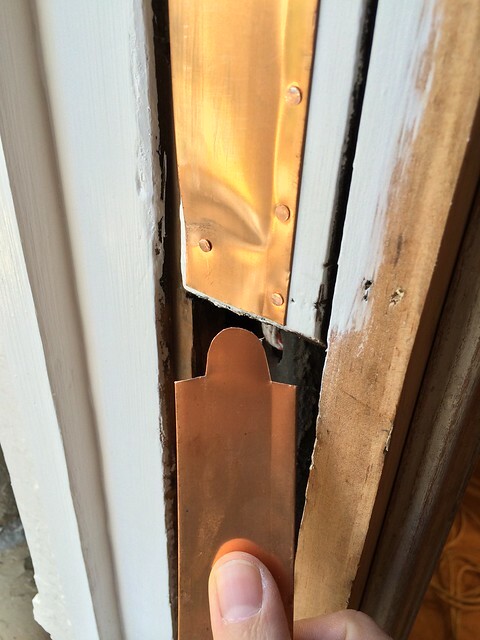 There are several different types and styles of metal weather stripping that will stand the test of time. The style that was on the windows before is an interlocking style that required a groove in the window sash. Personally, I really don't like this style, as it has several limitations and room for problems down the road. As a result, I'm swapping out the old zinc weather stripping on all of our windows in exchange for spring bronze. I ordered a large 100 foot roll of spring bronze years ago, as I knew I'd be using a lot of it as I worked on our doors and windows. I bought mine from Kilian Hardware, but you may have a local supplier who can offer it as well. However, if you're searching for a good supplier for spring bronze or zinc, they've been very reliable over the years. I've spoken about spring bronze before, back when we were weather stripping our salvaged front door, but installation of spring bronze on doors and double hung windows is a slightly different animal. Both animals are easily tamed, you just need to know how to approach them. 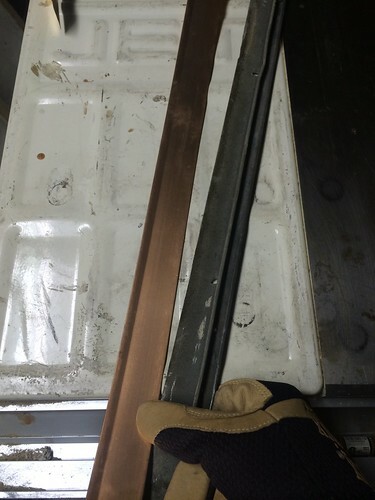 When it comes to window spring bronze installation, it's important to think about what we're trying to accomplish. The issue with windows, as I mentioned above, is with air sneaking in around the sides of the sash, rather than the top or bottom of the sash. For this reason we're going to put the weather stripping only on the window jamb's sides, not along the top or bottom, with the ultimate goal of tightening up the sides of the windows, keeping the sash snug against the jambs. 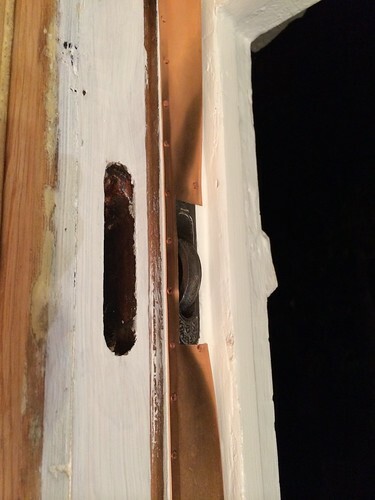 If you put weather stripping along the top of the window it will likely push the upper sash down and make it hard to lock or get a good seal. If we put it on the bottom it will cause the same issue by pushing the lower sash up, and it can also trap water and debris. I've made the mistake of putting weather stripping on the top of other windows, and now it's my duty to pay it forward so you aren't faced with the same issues. I start the project by working with the upper sash's weather stripping. When you measure for your first cut, measure from the top of the window jamb down to the point where the bottom of the upper sash sits when fully closed. 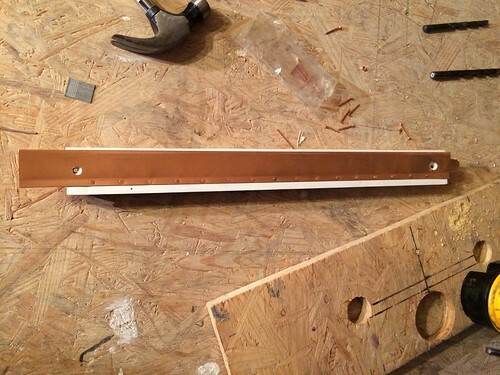 Add 2.5 inches to this measurement, as you want the weather stripping to extend below your sash a bit. One quick measurement later and you have your first cut. When I cut spring bronze, I prefer to use a pair of standard craft scissors. (Note: If you're borrowing your partner's good craft scissors, you may want to ask permission first. Lesson learned.) These seem to work much better than tin snips or a utility knife, and they offer better overall control. When working with the upper sash, if you have sash pulleys to deal with, you'll need to work around your pulleys when installing the spring bronze. I like to first cut a template piece out of a small length of spring bronze that accommodates the pulley without impeding the ropes. Nothing fancy, just a square notch. Starting with a single blank piece, hold it up to the pulley to mark the top and bottom on the template. Follow that up by determining the proper depth to clear the wheel section of the pulley and cut your square. The thick part of the spring bronze goes towards the inside of the house. Once the template is cut and I'm happy with the location of the cutout, I mark the boundaries of the cut on the jamb, then transfer them to the cut length of spring bronze from the earlier step. I then use the template to trace out the cut I'll need to make on the full length. Using the same scissors from the first cut, I cut out the notch. This takes a little patience to be sure I don't make an errant cut along the way, but it's a pretty simple cut. The key is taking your time and not bending the spring bronze. I repeat this same process on the opposite side of the widow, taking care not to damage the painted jamb or weather stripping during the measurement or cut. When it comes time to apply the weather stripping, I begin nailing at the top with a single copper nail, but I only sink it half way. It's extremely important to make sure the vertical and horizontal location is correct with the first nail, but I can still make slight rotation adjustments before placing the second nail. If I make a mistake when placing the first nail, it's a mistake easily corrected since I only sunk it half way. 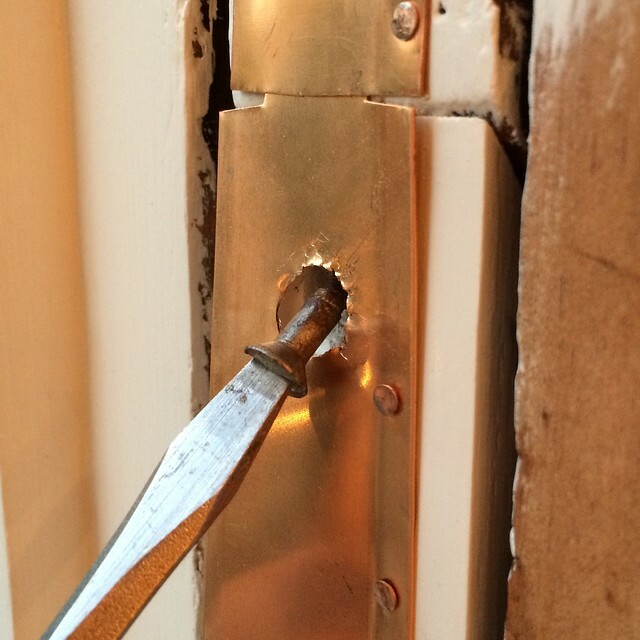 It's best to take out that first nail and start a new nail in a different location altogether, rather than trying to nail through the same hole. 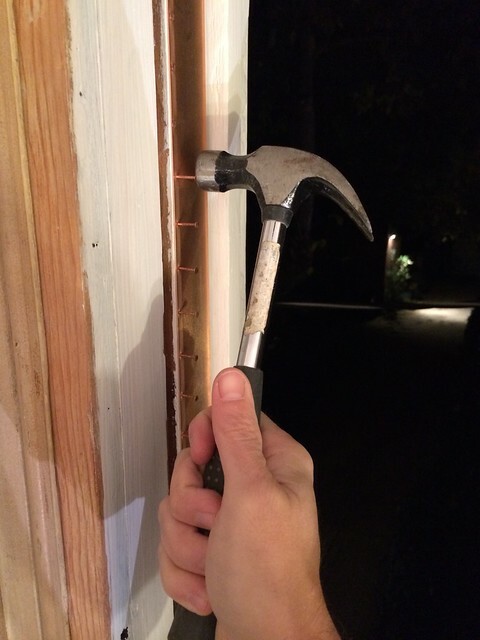 Once happy with the first nail, Placing the second nail about 1" down from the first anchors the weather stripping so it isn't able to adjust at all. In my opinion, the second nail is pretty much the most critical aspect of each piece of spring bronze, so I'm always saying to myself "okay, don't screw this up!" 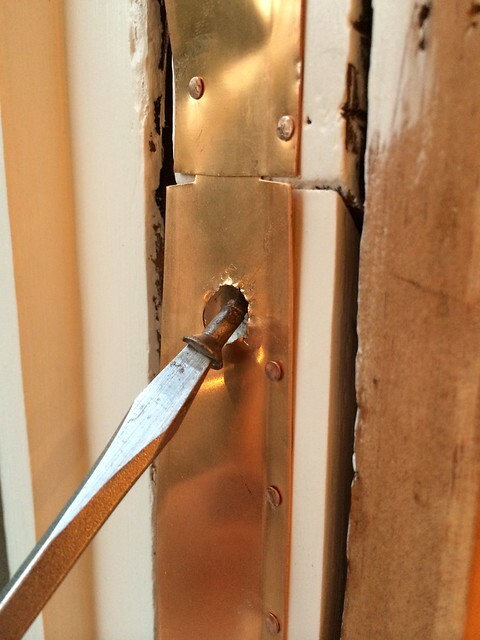 When the second nail is half way in, hold the weather stripping down to the jamb to check and make sure it all lines up and doesn't interfere with anything else, like the parting beads or sash stops. If all looks good, you're ready to move on, but if there anything wrong, now is the time to correct it. From this point the project becomes a little tedious and monotonous. (Wendy tells me it's a bit like this blog post.) I like to set a nail about every inch. 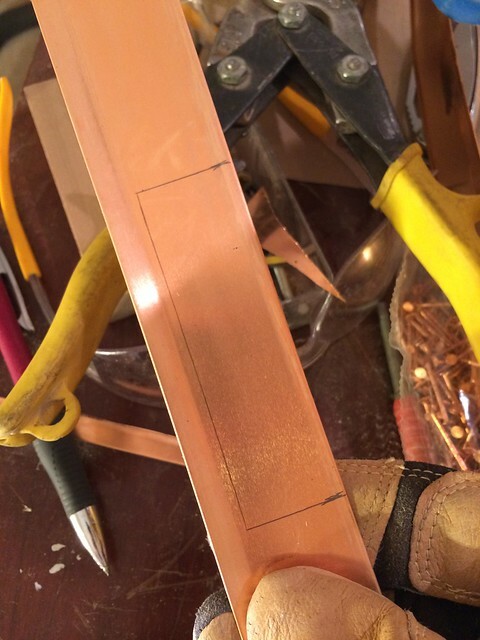 To speed this process I use a pencil to mark each nail location spaced evenly down the spring bronze. The easiest way I've come up with to do this is to use a few 1" brads as a guide and just keep moving and marking every inch. When all of my marks are in place, I begin nailing, top to bottom, sinking each nail about half depth. Again, half depth gets the weather stripping fixed in place, but the nails are easily removed if I encounter an issue. Once all nails are in place, save for the very last two or three, I go ahead and sink them all the rest of the way, trying to get them all as flush as possible. If any end up in a tight or difficult situation where the hammer can't easily reach (like near corners or around the pulleys), I like to use a large nail set to drive it the rest of the way. Before moving on I like to pull on the secured length of weather stripping to sort of bend it away from the surface. I work from the top to the bottom and I don't apply a ton of pressure, just enough to get it to permanently stay in the position where I want it to be. I feel like this helps ensure a better seal once everything is back in place. The final nails at the bottom of the pieces, where they extend from the bottom of the sash, are actually rather critical. Since the sash are moving up and down, leaving the end of the spring bronze unsecured allows for the possibility that the sash may snag the weatherstripping, ultimately damaging both. Rather than leave it hanging there and waiting to chew up your hard work, I like to tack the end down, securing it to the jamb. But I feel like just tacking it down makes it all too flat and doesn't promote a tight weather seal. Instead, I insert something (in this case, one of the nail sets) to keep the weather stripping away from the jamb, then wrap the bottom around a bit to nail the flap, making a permanent bulge. This bulge sets the tone for the tension on the whole length of spring bronze and makes sure the sash maintains a good seal with the jamb. It is important not to overdo it and make the bulge too large, otherwise your sash won't move smoothly, but a little tension is good. I use this same technique up around the pulley as well. It's important to tack these loose pieces in place, or it may snag on your sash over time, causing damage to the weather stripping. It does hurt the efficiency a bit, but it's better than the alternative. While the spring bronze on the upper sash is pretty straight forward, the lower sash has several options, introduced by the jamb's weight pockets. On one hand, you can just put up the spring bronze and cover the pockets, hopeful you'll never have an issue with you ropes that requires access. Personally, I never like the idea of "no access," especially since I just went to such great lengths to fix the issues with the jambs. And though I'm covering the sash restring as the next step, it's actually a step I was doing along with the weather stripping, so nailing the jamb pockets closed at this point would have made the sash restring much harder. Rather than make my life and future maintenance more difficult, I sacrifice some level of weather tightness for a compromise approach. For our setup, I prefer to install two lengths of spring bronze on either side of lower sash jamb, one on the top portion of fixed jamb, and one on the removable portion of jamb weight pocket door. The first length at the top is pretty straight forward. I cut a length of weather stripping and install it as I did for the upper sash. It extends above the lower sash a few inches, but it terminates just above the top of the jamb pockets. 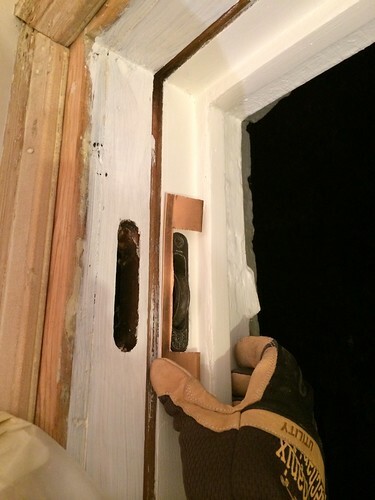 The second length then installs right onto the jamb pockets, so it can still operate as an independent piece of the window, rather than nailed right in place. However, with this break mid sash, especially on the sash that is opened and closed most frequently, we really need to worry about snagging and bending the weather stripping. The key to this second piece is how the two join together. I like to fully secure the upper piece in place and to cut a bit of a rounded tab at the top of the second piece that can fit under the upper piece, forcing it to lay flat and out of the way of the sliding sash. This approach does mean there's less of a good seal around the window at this point, but it's not a terrible sacrifice for keeping the window in a maintenance accessible way. When the tab is slid under the other piece, it's a smooth and snag free existence. 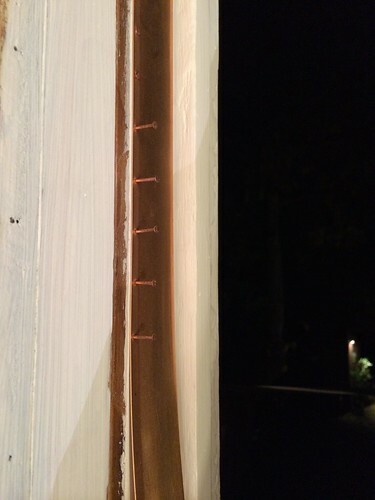 After applying these lengths of spring bronze to the jamb pocket doors, a few holes need to be drilled in the spring bronze to accommodate the set screws that hold the jamb pocket doors in place. I find it's easiest to drill the spring bronze when flat on wood, or better yet, when sandwiched between two pieces of wood. This gives you the cleanest hole without chewing up the spring bronze in the drill bit. 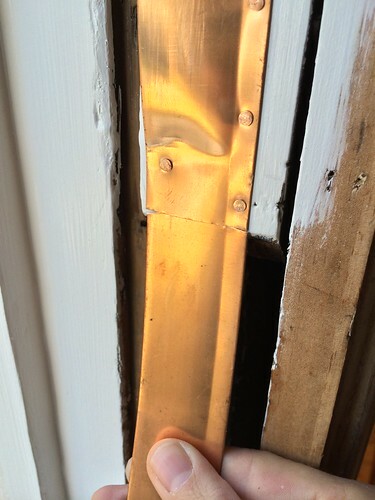 It's also worth noting that this second piece extends beyond the bottom of the jamb pocket door to the base of the window frame, but isn't nailed in place. At each step it's good to test out the fit of the sash by putting it in place and ensuring it still moves smoothly and as anticipated. As I keep saying, it's much easier to fix problems midway through the step than it is once all of the nails are fully set. When combining the spring bronze, installed as I've outlined, with storm windows and additional weather stripping along the meeting rail (I'll cover that when I'm talking about the sash work), your windows of any age will be nearly as efficient as the most expensive models on the market today. 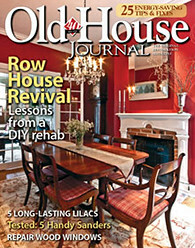 But the best news, your old windows will outlast just about any new windows without question. Our next post on this subject will cover the critical process of re-roping your window sash and weighted pulleys. As I mentioned, I was doing that aspect of the project as I was installing the spring bronze, but it's generally easier to cover them as separate topics, so please excuse the chronology. There are definitely a few tricks to the process that can make the whole thing much easier to handle. 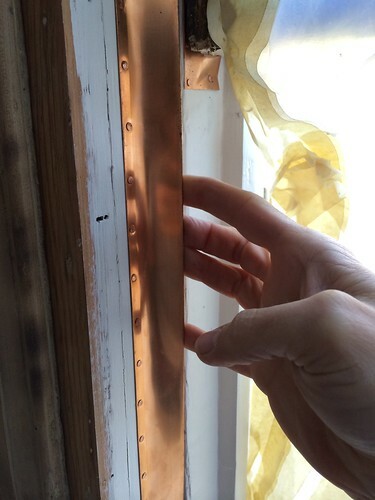 It's my hope that you'll find this topic at least somewhat useful, especially if you're installing your own spring bronze weather stripping. And I hope the tips and tricks I've picked up along the way are useful in helping you in your install. 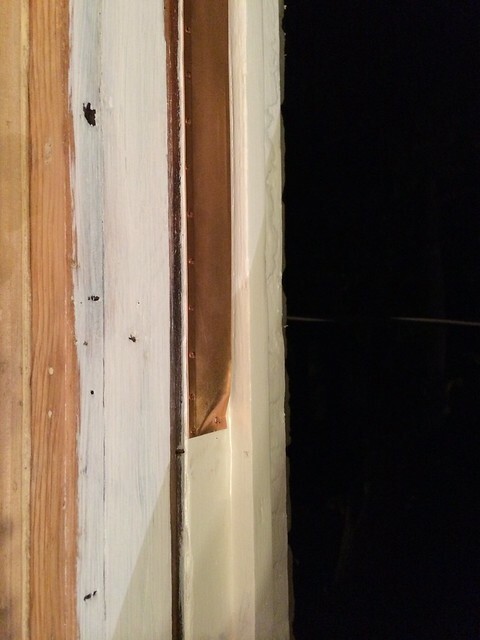 I can tell you one thing about this weather stripping, even without restored sash, and without parting beads, this window is still tighter than it ever was when we had the old, damaged, and improperly installed weather stripping. Now I'm off to work on a DIY install of a home security system, have a bathroom to renovate, and storm windows to build. Uh oh. I guess I really am guilty of starting new projects before finishing my existing ones. I've had some bad experiences with spring bronze (cuts), but I'm going to get some and give this a try when I restring the dining room windows. One question on paint. The exterior paint will not be a problem, white trim, very standard, but the interior of my windows are shellaced, fumed oak. Suggestions on how to handle this? I'm thinking colormatched matte poly on the siles and rails because the shellac has failed almost everywhere the glass touches due to humidity, seepage or condensation. I'm desperatly trying to save it (or restore it or replace as a last resort) as much as I can, though, on the windowsills, window frames and casings. I'm NOT painting 100 year old quartersawn oak LOL. "Now I'm off to work on a DIY install of a home security system, have a bathroom to ..."
I have 19 windows to refinish. I know...shoot me now please. This series is very much appreciated. How long did it take to complete the weatherstripping for this window? My wife would want to strangle me if I left the window out for an extended period of time. Alex, I continue to be amazed at your professional-level work. I've commented previously on this, but it's worth another comment. As a professional conservation technician, I have never seen your nifty little idea for dealing with the pocket in the lower sash channels. I'm going to start using your trick! Also, Kilian Hardware is one of my favorite places, and I'm lucky enough to live only 10 minutes away. I'm sure you already know, but they carry tons of products for window restoration, from DualGlaze Glazing compound (my favorite), Abatron products (like WoodEpox) to sash chain and sash cord, to tons of kinds of weather stripping. If you are ever in the Philly area, it is worth a trip! I love your blog, and have spent the last several hours reading back through your old posts. Our home was built in the mid 1980's and we have thought about replacement windows. After reading this post, tho, I'm curious if this process would work for our double-hung wood windows, to make them more air-tight. Any thoughts on this idea? Thanks! Yours is the most thorough, detailed, best description of spring bronze installation I have read. Thanks! -GC. 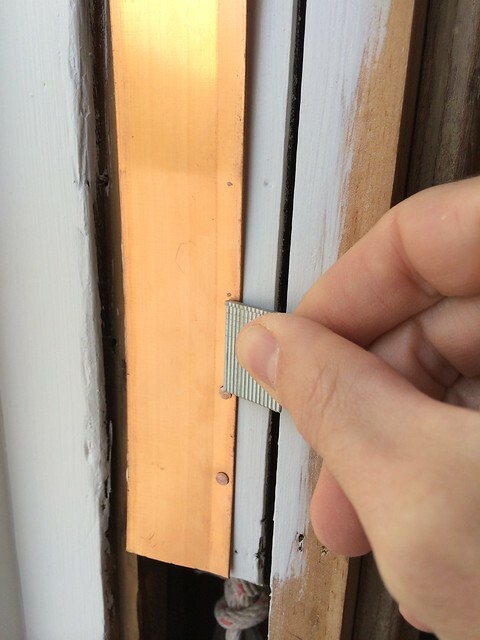 Do you need to install the strips to the entire height of the window for an upper sash? I would think not, as it stays in place year round. I'm assuming only the inner/lower window sash would require the stripping along the full height of the window. Please correct me if I'm wrong. Hello...in your second photo you have both the spring bronze weather stripping and what appears to be an original weather stripping. My wood sash windows have this type of original weather stripping. I'm wondering if it's possible to still find this type of weather stripping? Do you know what it is called? Thanks for letting me know. The grey metal weather stripping is called interlocking metal weather strip. There are not many companies that sell it retail, best to contact your local window restoration professional. You can find one at www.windowpreservationalliance.org. Or SRS Hardware www.srshardware.com carries most of what you need. Does the width need to be smaller than the width of the sash? I have just finished installing spring bronze on my first two windows using brass nails and a punch. Looks great, but it was tedious work. Can I use an 18 gauge brad nailer or a 16 gauge finish nailer as an alternate? Both are pneumatic, adjustable for depth, and work well in tight spaces. I followed your instructions and wondering if the spring bronze is supposed to be visible above and below the sash on the finished double hung window? Mine shows on both. Yes, it should be minimally visible. It will brown slightly over time. The original was zinc so it was far more grey/green naturally. Hello: I am interested in installing the spring bronze product. Have you tried the Jamb weatherstrip, either standard or with the return flange? 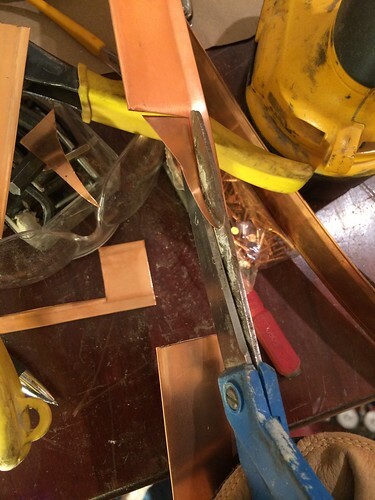 This requires cutting a kerf in the side of the sash to create a channel for the "interlock." Does this style offer a better R value? 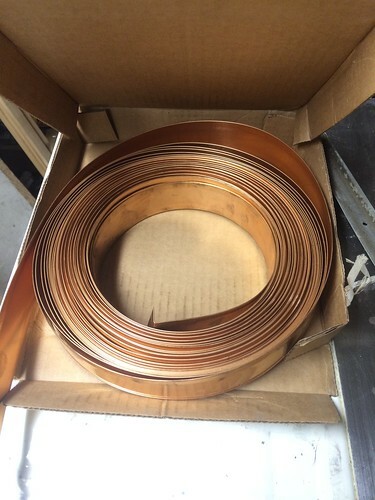 Or is the standard spring bronze Pro-Type (single leaf) weatherstrip do well enough. Also, do you have storm combinations on the outside of your windows? What do you do about the meeting rails? Hi Patrick. I've actually been removing the traditional jamb weather stripping from our windows by filling the kerf in our sash. So far the single leaf has done well, but my goal is to pair it with a nice storm window to keep air movement to a minimum. I'm still deciding between an interior flexible storm or an exterior custom wood storm. Instead of weights and pulleys my windows have spring loaded pins. Should I try to drill the holes for these through the bronze material? I wonder if the pins traveling over the bronze would tend to flatten it out?